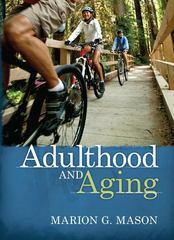 Adulthood & Aging 1 Edition For undergraduate courses in Adulthood and Aging, Gerontology, and Adult Development. This text provides an engaging perspective on the issues, challenges, and joys of adult development and aging. It provides a balanced and integrated treatment of young, middle, and later adulthood, concluding with a discussion of life satisfaction and quality of life issues. More than ever there is a need to inform those who will be therapists, health care professionals, social workers, and all others who plan to work with adults in some capacity of the challenges and opportunities that often come our way in adulthood. In addition, this text covers areas which are often neglected, such as self development and individual differences, life-long learning, community and political life, and values and moral development. The addition of these and other topics, along with a positive-growth focused perspective sets this book apart from other textbooks in this area that have grown out of gerontology backgrounds with a focus on physical decline and illness. The pedagogical features of the book direct students to key information, and the special features engage the reader in current ethical dilemmas and life-planning issues.